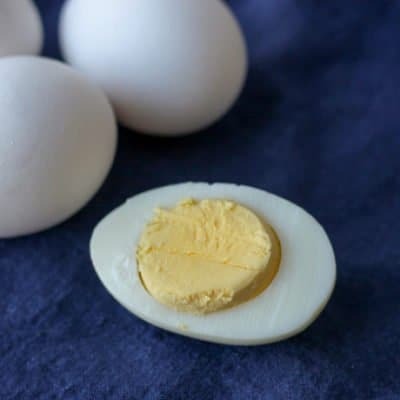 The easiest thing to make in a pressure cooker (either Instant Pot or Crockpot Express) is probably hard boiled eggs. They aren’t exactly hard “boiled” since you’re essentially steaming them in a pressure cooker, but you get the idea. It creates the same result: hard cooked eggs. 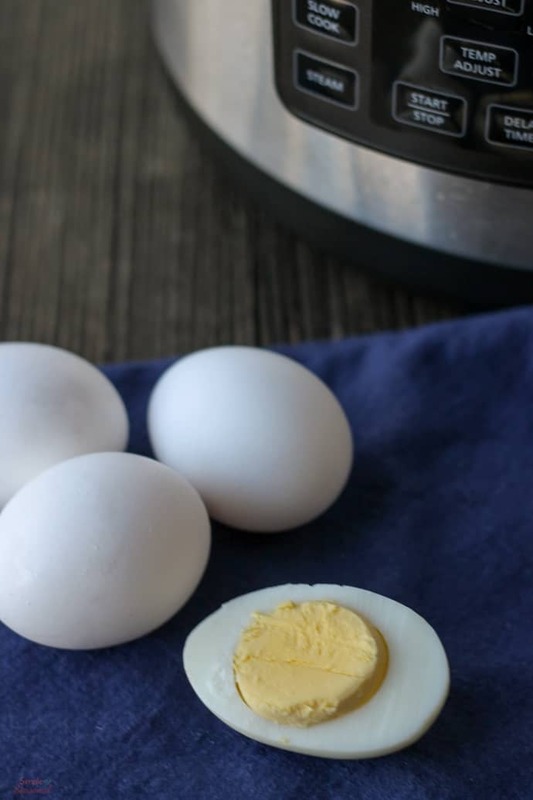 There are plenty of benefits to making Crockpot Express Hard Boiled Eggs: they cook faster than the traditional stove method, they are crazy easy to peel, and you can make as few or as many as you like. Personally, I like my egg yolks nice and firm. I don’t want any gooey gunk in the middle of my egg. But if you like yours a bit softer, you can just reduce the time. There’s a 5-5-5 rule of thumb going around, which is 5 minutes cooking, 5 minutes of natural pressure release and then 5 minutes in an ice bath before peeling. However, I didn’t find the texture to my liking with those times, so I adjusted for my own tastes. 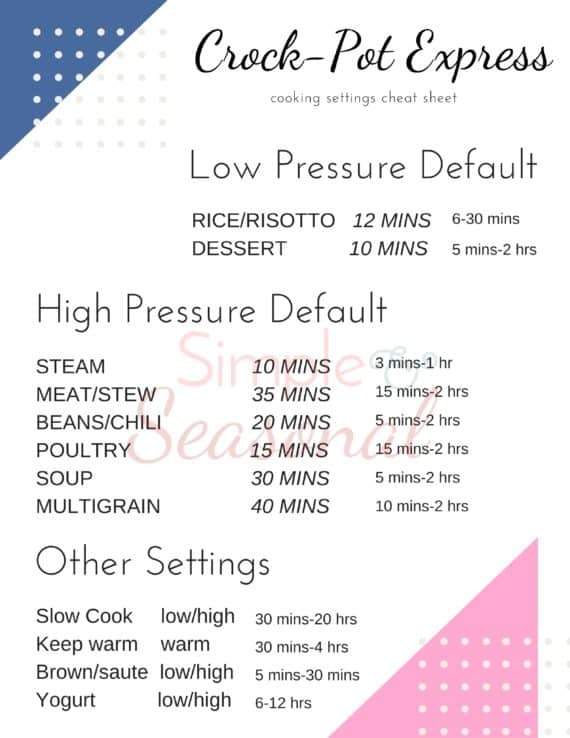 I thought this was a great visual from Pressure Cook Recipes. They did a very thorough testing and show details and results of each minute increment. You can read all about their experiment here. 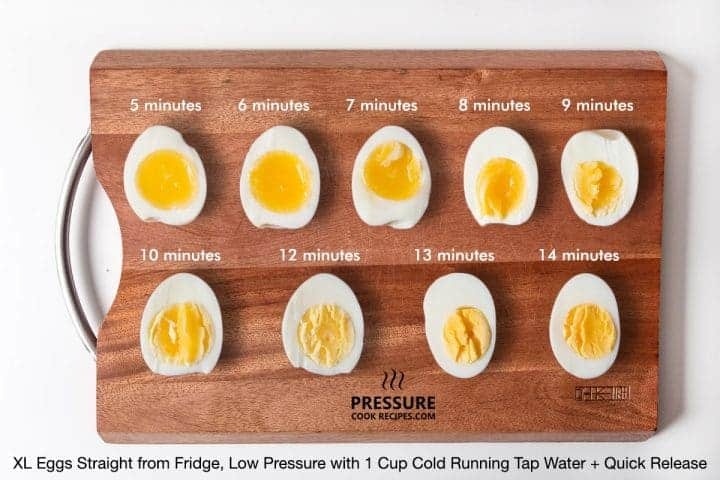 For my own Crockpot Express Hard Boiled Eggs, I went with high pressure for a longer time (than the 5 minute suggestion) and countered the longer cook time with a quick release and ice bath. Some people have noticed a more rubbery texture in the egg whites when using high pressure, but I was totally fine with how mine tasted and felt. I actually prefer it to the more creamy white that you get using low pressure. 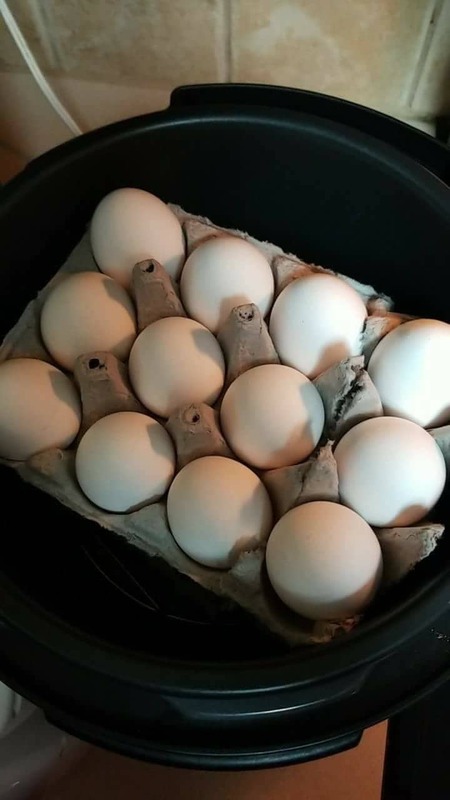 If you haven’t figured it out yet, there’s a lot of leeway when it comes to making hard cooked eggs in a pressure cooker, so just play around with it (one egg at a time so you don’t waste food) until you get the results you love! Then get started on other great Crockpot Express Recipes! 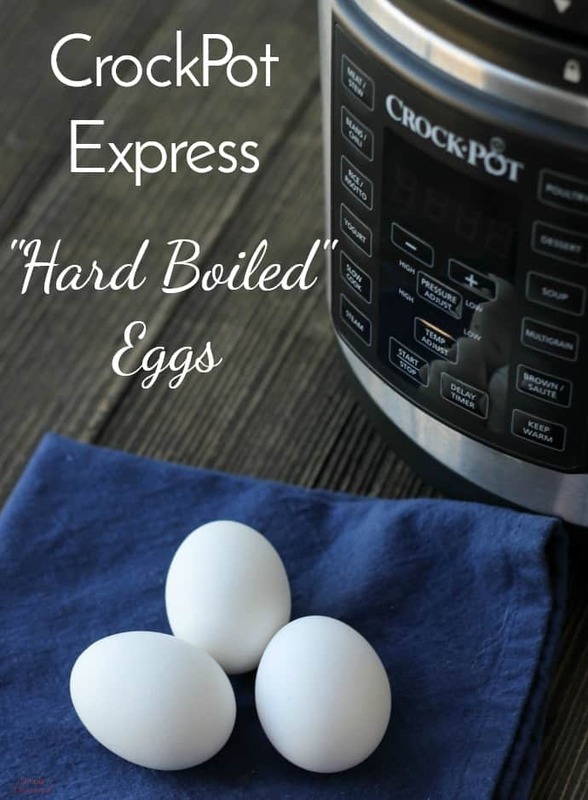 Making hard cooked eggs in the pressure cooker (Instant Pot or Crockpot Express) is a great "no fail" kind of recipe for beginners! Place trivet in the pot and pour the water in the bottom. Add eggs to the trivet. Close lid (and steam valve) and set to "Steam" (manual pressure for Instant Pot) and adjust time to 7 minutes. 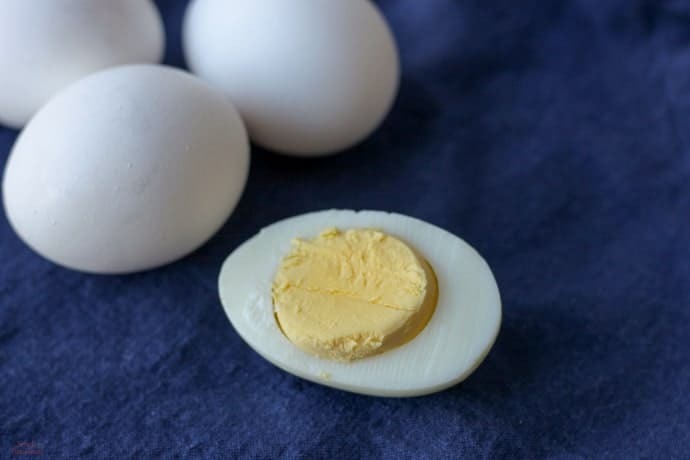 After cooking, do a quick pressure release and remove eggs into an ice water bath. 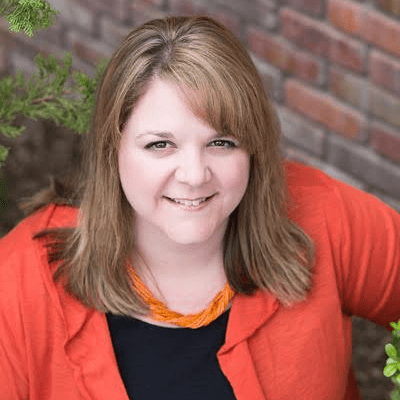 Hi Nicole, thanks for all your great info and help. If I do 24 eggs, do I need to increase the cook time? Or will the extra time to get to pressure be enough extra time? Nope! No need to add time for more eggs. It may take a tiny bit longer to come to pressure, but not much. There’s a lot of air in there- it’s not like a full pot of soup 🙂 Whether I do 6 eggs or 24 eggs, I cook them for 7 minutes and do the quick release/egg bath. Comes out perfect for us! I finally got my eggs to come out perfectly. I’m ecstatic!! Congrats! They are so great in the CPE! I set timer for 7 minutes. They were soft inside. Was I supposed to wait 10 minutes before taking the eggs out of cooker? Did you cook on high or low pressure. No, you generally don’t wait. I pull them out right after the CPE “beeps” when the 7 minutes is up and they straight into the ice bath. Okay, so I am constantly teased, because I am an great baker and cook, but I can’t make an hard boiled egg to save my life. Well got this handy dandy little appliance and followed your directions and we’ll, let’s just say I was doing a happy dance in my kitchen. Thank you as 7 minutes was perfect. If using the egg carton to cook the eggs, do you still use the wire rack inside? Help. I cooked tehm on Steam for 15 Min., Let them sit about 15 min., put in ice bath for about 15 min., they turned out “yellow-ish” in color not white. They taste fine, but look awful. Any ideas? Did I over-cook? You definitely overcooked them! They don’t need more than 7 minutes, and then you do a quick release and get them into an ice bath right away to stop cooking. Mine kept saying heating and never counting down? First time using my CPE XL, followed your recipe and they came out great. Great guide! Just got the Express Pot and I love hardboiled eggs. They are a part of a quintessential scandinavian breakfast. Sometimes I like them soft boiled or if I’m taking them to go I want them hard boiled. Your times are right on the money. If you add a aromatic flavor to the water it will slightly flavor your eggs. Fish sauce is the best. My kids love deviled eggs, so this is so much quicker for making them! (And way easier to peel, too!) I’ll have to try some different flavors as you suggested!